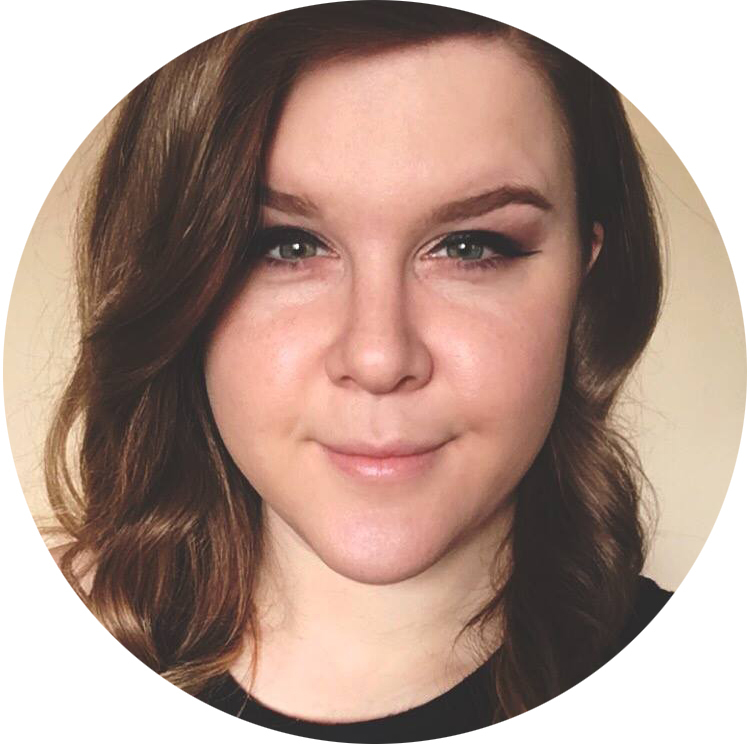 I began by applying Highlight as my base. I wasn't thrilled with the formula of this one, though I do love the color. It was fairly thin and sheer. I used three coats here. The roses were simple. I put down a black blob shape, then used a small nail art brush to add the dark and light grey detailing. 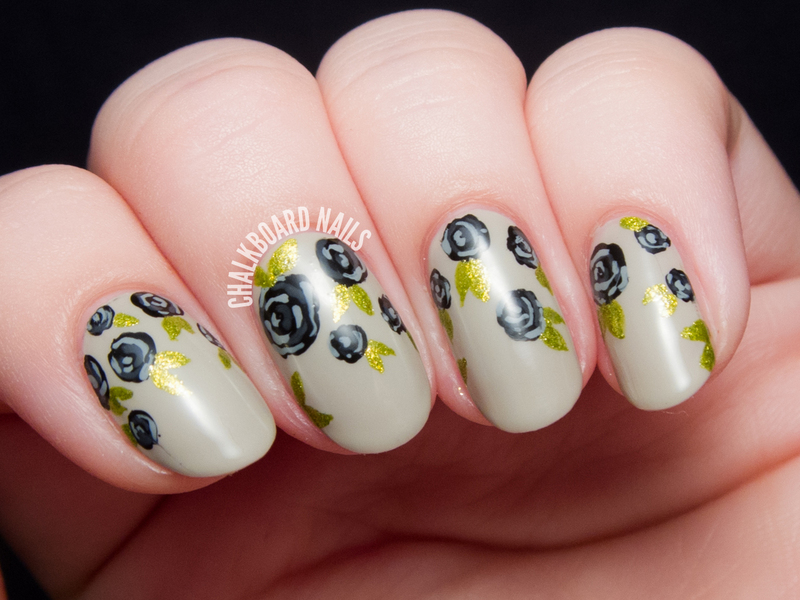 Chelsea Queen has a great rose tutorial you can check out for guidance. I then added the leaves, making sure they ended in points, and sealed everything in with HK Girl topcoat. This is the second time I've been pleasantly surprised by the weirdness of a Deborah Lippmann shade; the first time was I Wanna Be Sedated. It's cool to see a brand that I usually associate with "pretty" shades do something odd, and the shimmer/foil in this one is showstopping. I often do florals, but they are usually softer and more delicate. I am enjoying the contrast in this manicure, and still feel like I'm getting in the mood for Halloween! So pretty and the color choices are just spot on. I dig it. It feels beautiful and eerie at the same time! Very pretty, the flowers are just perfect! That is beautiful! I love the leaves, that gorgeous shimmery foil look and color. This is a fantastic manicure. 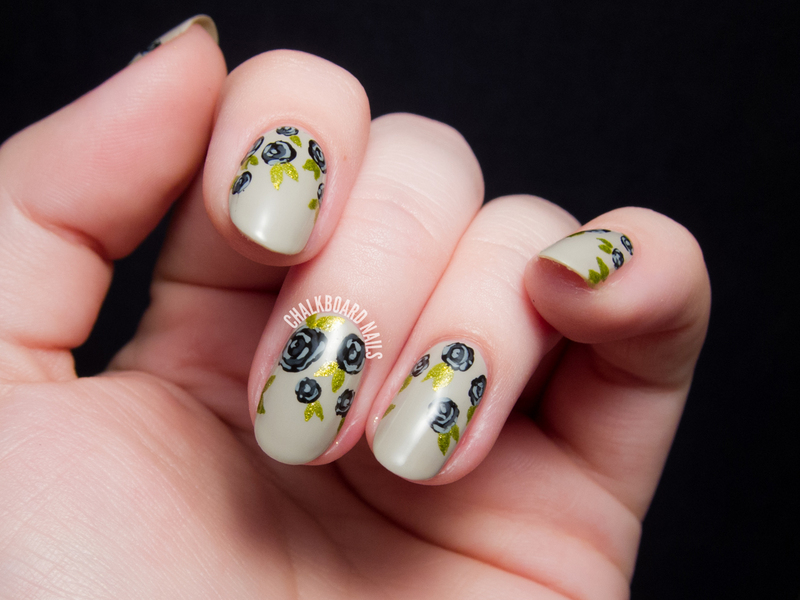 I like the black and gray roses and your new nail length and shape. It looks great! 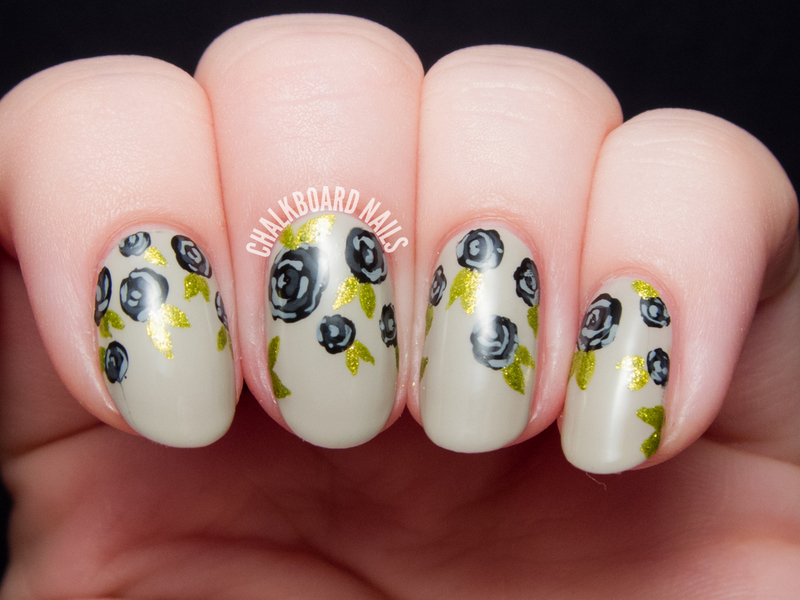 I think it is a great color combination, and I especially like that the roses only cover half of the nails and you left some of the base color "untouched". Beautiful nail art. The green color is really rocking the manicure. Ooh I love I love! Plus, I am in awe of your ability to leave space without a design on. I struggle sometimes with the perfect balance between detailed design and it not being too cluttered! Definitely love the black roses and the green leaves. Simple design but you made it fab! Hey, can you please drop by my blog and give it some comment? Oh my god! I may have found the perfect chartreuse. They are the biggest part of my nail collection -- many failed experiments along the journey to find the perfect yellow green...Love this look too! It's a really interesting shade for sure! If you google the shade name, a few people have swatched it alone (vs. using it in nail art). &Thanks!